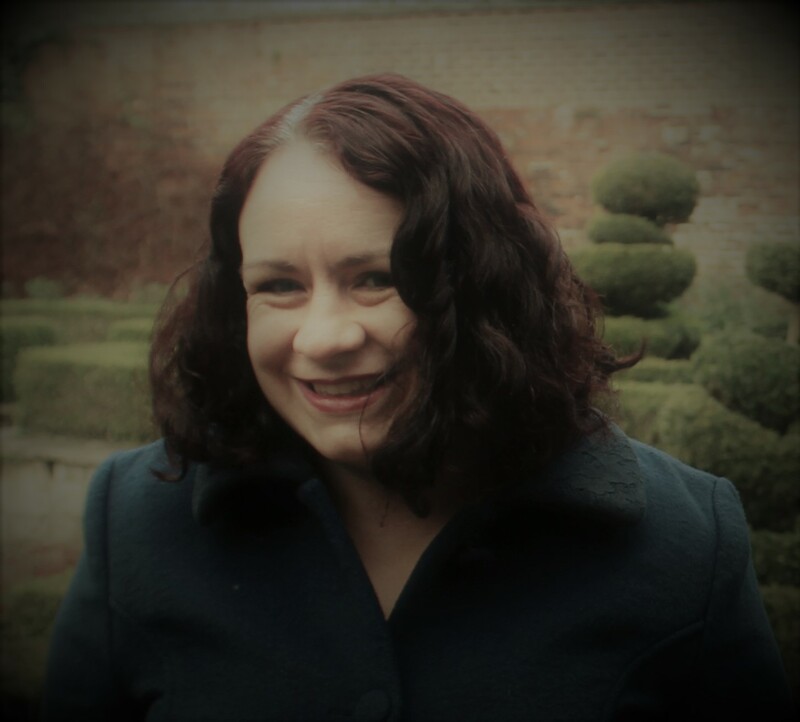 So, I'm not really much of a gin drinker - and I know what an unusual thing that is for a blogger to admit. I have gone as far as to declare, publicly, and on more than one occasion, that rum is better than gin. 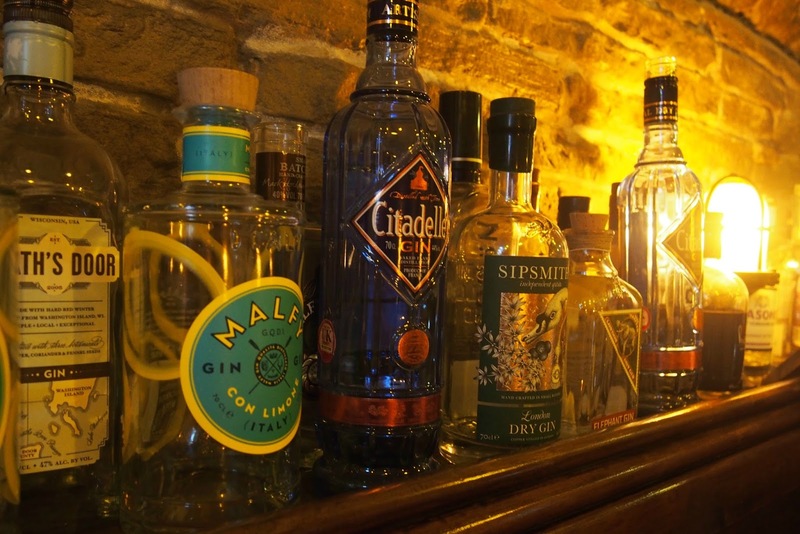 But even I am not blind to the really cool and exciting gin based developments of recent years, and recognise that I'd do well to learn to embrace this trendiest of spirits. The best place to do this was invariably Bradford's The Gin Bar, tucked away in the city's exciting Sunbridge Wells development. 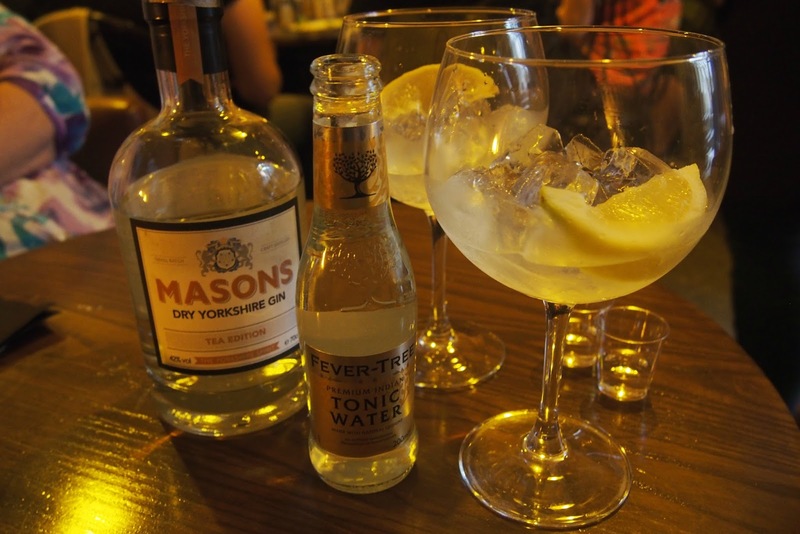 This cosy little gin joint is reason enough in itself to get on board the gin train, and a recent collaboration with Masons Gin give me the perfect opportunity to wrap my brain and tastebuds around this boozy revolution! 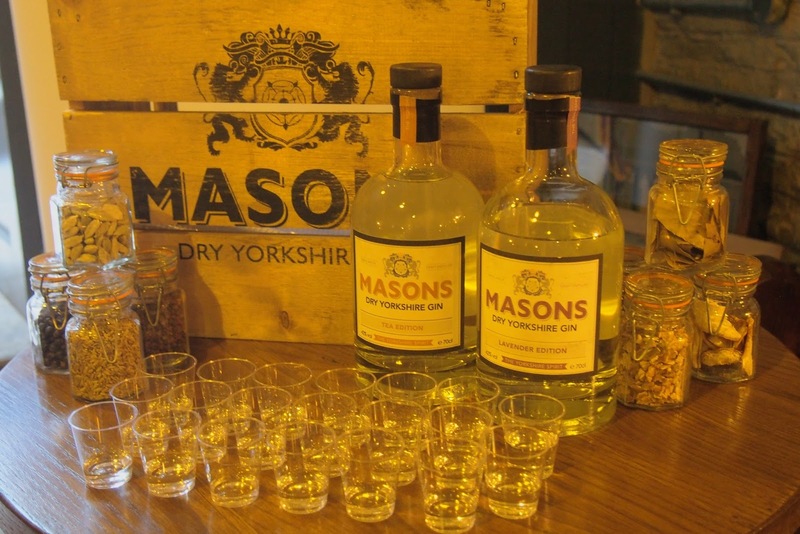 Now, I know I said I wasn't a big gin drinker but still always known that Masons was my gin company, if for no other reason than they are The Most Yorkshire of Gins. Not the only Yorkshire based gin company by any means, but the first and biggest. 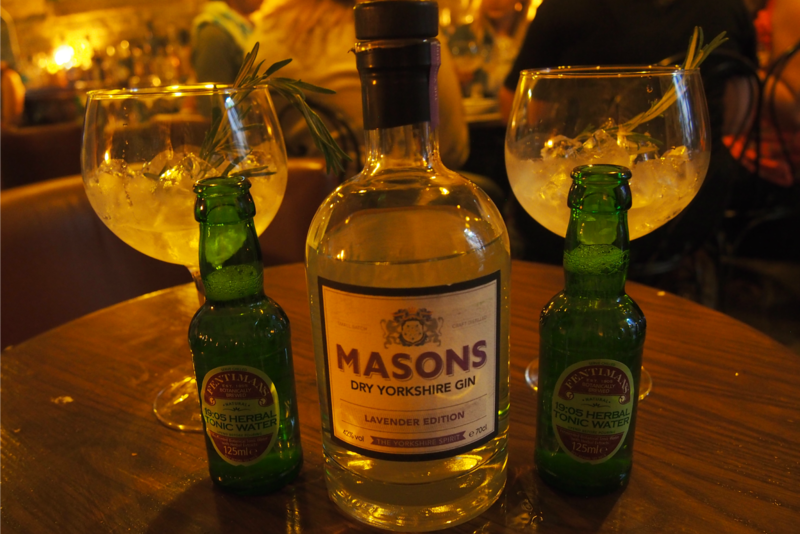 Our evening consisted of drinking our way through the different gins produced by Masons, while their ambassador Sophie talked us through the history of gin in general and Masons in particular, all while we nibbled cheese and biscuits - certainly not a bad way to spend an evening! The Masons original blend is, in my uneducated opinion, a lovely gin (paired beautifully, on this particular evening, with a really interesting cucumber and watermelon tonic from Double Dutch), but my real star was the Tea Edition. I'm of the belief that most things can be improved by adding tea, and it turns out gin is no exception! I was also intrigued by the Lavender edition, served up here with Fentimans Herbal Tonic Water and a sprig of rosemary - a combination that on paper sounds like it could be a tad overwhelmingly garden-tasting but was actually rather wonderful. To finish off before heading home, I figured I really should take advantage of the evening's offer of £5 Masons cocktails, and try out my new favourite beverage in yet another tasty combo. 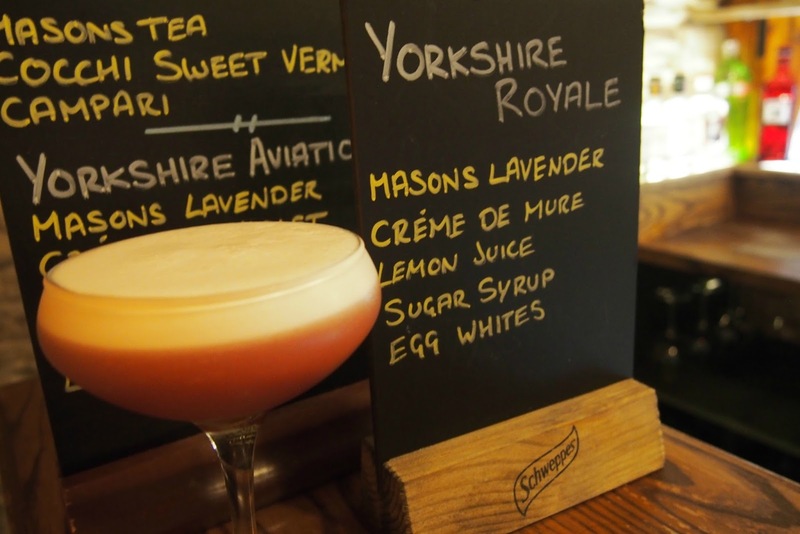 I let myself be talked into the Yorkshire Royale ('talked into' because the idea of egg-whites in drinks makes me a feel a bit icky, but the Gin Bar guys really know their stuff and wouldn't lead me astray!) I'd have loved to have tried all the speciality cocktails on offer but 'twas a schoolnight, so sadly it was time to head home. Now I've got my foot in the door of the world of gin, I know how much I need to learn and experience! Do you have any favourite gin brands to recommend, or any unusual serving suggestions you think I might enjoy? I'd have never really picked it before, but I'm definitely coming round! I will admit to being a cocktail fan - it's not the boozy ingredients usually, it's how pretty and fun they are! This sounds interesting. A friend of mine introduced me to gin a few weeks back... She got a selection of gins and mixers out, and we made an evening of it. It quite enjoyed it!